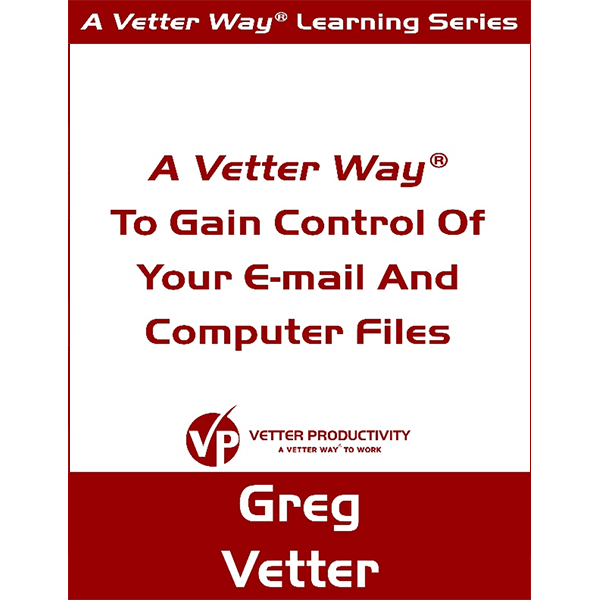 Gain Control Of Your E-mail And Computer Files | Vetter Productivity, Inc. 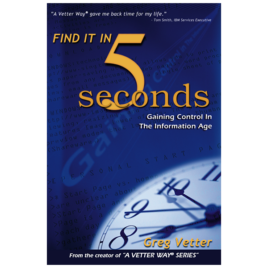 This is the complete, unabridged workbook that Greg Vetter uses in his Gaining Control of Your E-mail and Computer Files on-site training for companies including Chick-fil-A, Morgan Stanley, and The Coca-Cola Company. 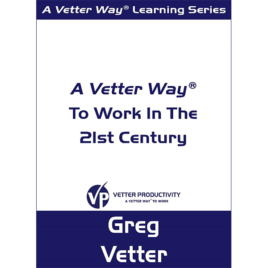 You will have full access to the nationally acclaimed A Vetter Way® organizational system for your e-mail and your computer when you use this workbook as your personal guide. You will learn the most efficient and PROVEN methods of going through your Outlook Inbox; setting up your information storage system in Windows Explorer; setting up your work system in your e-mail program; creating an information flow using a unique method developed by Greg Vetter over 25 years of working with people in offices of all sizes and industries. 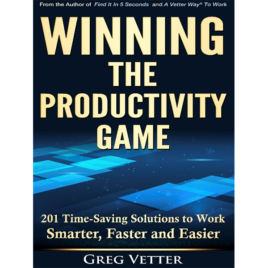 This workbook reveals the steps to learn four new ways to work, and includes twelve pages of time-saving e-mail shortcuts and techniques. A Glossary, review questions and answers, and a step by step section on how to set up your electronic system make this workbook user-friendly as well as turnkey.